The Grownup originally appeared as 'What Do You Do?' in George R.R. Martin and Gardner R. Dozois' Rogues anthology. I've been telling myself I should read some Gillian Flynn ever since Gone Girl took over the world in the way it did, and now that I've finally read some of her work I'm definitely interested in picking up one of her novels. As much as Gone Girl seems to be her favourite among readers, I'm actually much more interested in picking up Sharp Objects or Dark Places. 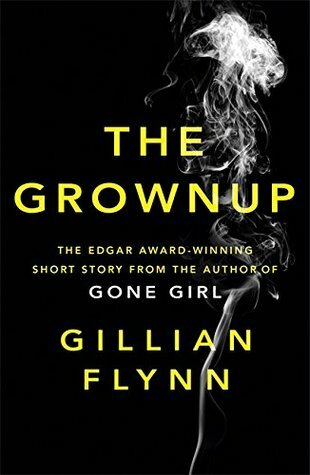 The Grownup is a short story, and I never really review short stories on their own, but I decided to make an exception for this one. It's so easy to read with a very likable protagonist - at least I certainly liked her, though I've always had something of a soft spot for characters who are con artists, such as Orphan Black's Sarah Manning. I really enjoyed reading about the history of The Grownup's unnamed narrator and now she'd ended up doing what she was doing, and as soon as I learned a spooky house was involved I knew I was going to enjoy this story. What can I say? I'm weak for a haunted house. Throughout the 60+ pages of this story Flynn scattered little tributes to some of the best Gothic fiction out there - The Haunting of Hill House; The Woman in White; The Turn of the Screw - which I loved, and I think she did a wonderful job of capturing the atmosphere that usually comes with a Gothic story, making the middle of this story my favourite section. Then the third section happened and the story got a bit silly. There are multiple twists in this story, and while the first one took me completely by surprise and had me ready to give this story five stars and proclaim it one of the best short stories I've read in a while, the twist that followed kind of ruined it for me. Suddenly the story was weaker and it didn't seem as believable as it previously had been, which was a real shame. I still really enjoyed it - it's got me looking forward to reading Flynn's novels and to reading the other stories in Rogues, which I actually own a copy of - but it could have been amazing if Flynn hadn't gone that step too far. Still, for just £2 I can't complain too much! I've only read Gone Girl by her so far, but all of her other books look great too. Great review, this one sounds interesting!